Before you get or give another flu shot, read this intriguing background on virus-infected dogs and exhibitors coincidental to UN Of Florida development of the canine flu vaccine. We want your feedback (below) so that staff can compile updated information on the actual occurrence of canine flu in 2019. When dogs and exhibitors became sick with "the crud" on the January 2005 Florida dog show circuit, we had no idea that we could be test subjects for a new flu vaccine, especially since no one had ever heard of nor experienced flu in a dog... After the fact, the CDC released this statement which is still on its website "Canine influenza H3N8 virus originated in horses, has spread to dogs, and can now spread between dogs." But the most puzzling statement by the Center For Disease Control is this quote excerpted from a Sept 2005 press briefing. "So what about the implications for public health? We must keep in mind that this H3N8 equine influenza virus has been in horses for over 40 years. In all these years, we have never been able to document a single case of human infection with this virus." A cover-up or a patently ridiculous statement? Many of the dog show exhibitors (otherwise known as humans) sought medical attention for "The Crud" while on the Florida January circuit that same year. It seems improbable that CDC would not have known that. Here is another press release meant to defuse an explosive situation but which reads like a time bomb getting ready to blow up. TALLAHASSEE - Sept. 20, 2005 - Florida Agriculture and Consumer Services Commissioner Charles H. Bronson today alerted the public to an emerging canine respiratory disease that can mimic symptoms of “kennel cough” but is more serious and generally requires the attention of a veterinarian. "Known as “canine influenza” or “canine flu”, the disease is caused by a virus that recently has been identified by the University of Florida's College of Veterinary Medicine researchers and has been responsible for severe respiratory disease outbreaks in the past year among racing greyhounds in Florida and other states. "The highly contagious virus is beginning to show up in dogs in shelters, boarding facilities and clinics in several areas of Florida, including Miami-Dade, Broward, Palm Beach and Duval counties. And with Hurricane Katrina evacuees accompanied by pets temporarily relocating in numerous parts of Florida, Bronson believes that the disease could increase in coming weeks. The state's warning was 9 months too late for the outbreak of a zoonotic disease that had sickened exhibitors and their dogs during the January show circuit in Central Fla.
“We already have alerted veterinary practitioners throughout the state to be on the lookout for canine flu, and we believe it is prudent at this time to advise the public to be aware of symptoms of this respiratory ailment and to respond appropriately,” Bronson said. "Like “kennel cough”, symptoms of canine flu include a cough and nasal discharge - and sometimes fever and listlessness. The State Veterinarian’s Office, which is a division of Bronson’s department, recommends consulting with a veterinarian if the dog experiences severe symptoms or fails to respond to normal “kennel cough” therapy, which generally involves antibiotics. "Because canine flu is a newly-emerging disease, all dogs, regardless of breed or age, are susceptible to infection because they have no naturally-acquired or vaccine-induced immunity. While most dogs that contract the disease experience what is regarded as the milder form of canine flu, some develop a more acute disease with clinical signs of pneumonia. Among the latter group, the mortality rate is between 1 and 5 percent. Our veterinary writers and Science And Advisory Board Members believe this is but the tip of the iceberg of newly emerging canine and human diseases. Looking back with 2019 perspective, we must consider there was in 2005 not much international animal travel and the "flu" was at that time, confined to one small area of a rather isolated state. If someone "brought it in" why was it not reported elsewhere in the U.S. during that time? 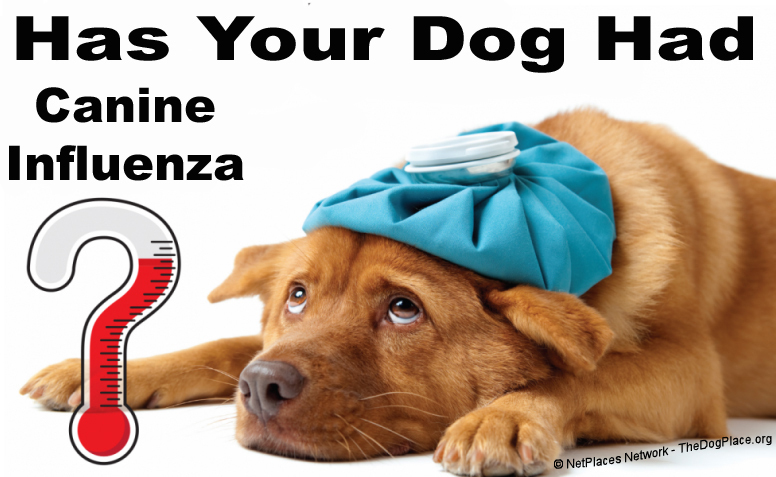 Click to let us know if any of your dogs have ever had Canine Influenza. Instant Information on ii Vaccine Facts, why non-core (unnecessary) vaccines are FINALLY defined. The History Of Canine Flu, which by the way, preceded the equally zoonotic Swine Flu outbreak, is more than disturbing. The "history" article covers the probable source of the species-jumping Dog Show Crud outbreak in Florida, January 2005.